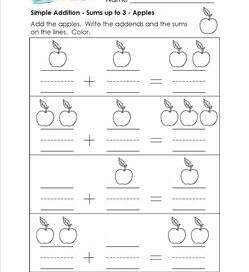 Our simple addition worksheets continue to use pictures for addition practice. Children count the objects and write the addends and the sums on the lines. There are pictures for each addend and the sum. 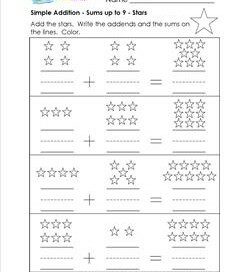 The worksheets are divided incrementally from sums to 3 up to sums of 10 to provide a progression for learning. Primary writing lines are provided to encourage neat writing. 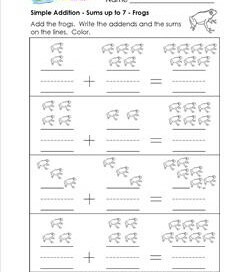 These worksheets provide the first steps to writing an addition equation. 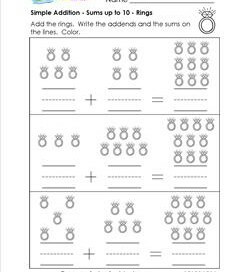 Please go to this page to see all the kindergarten addition worksheets in this site. Sums to 3. 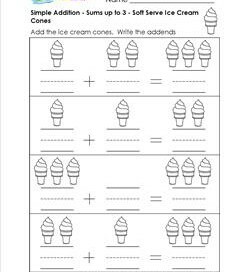 Count and add the soft serve ice cream cones in this simple addition worksheet. Color them yummy flavors! Sums to 5. 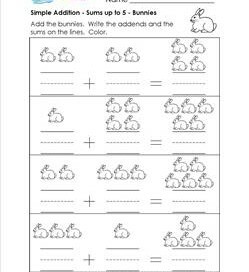 Count and add the cute bunnies in this simple addition worksheet. How do bunnies feel? Nice complement to an animal unit. Sums to 5. Who wants to play football? 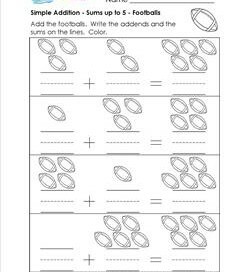 Count and add the footballs in this simple addition worksheet and you just scored a touchdown! Sums to 7. 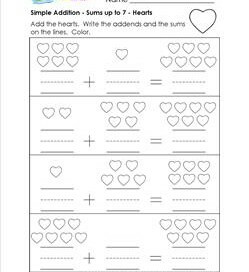 This simple addition worksheet is perfect for Valentine’s Day. Count and add the hearts. Color them the colors of love! Sums to 9. Strawberries! So sweet and juicy when in season. 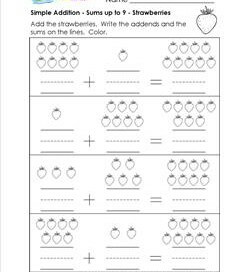 Count and add the strawberries on this simple addition worksheet. Color them bright red. Sums to 10. 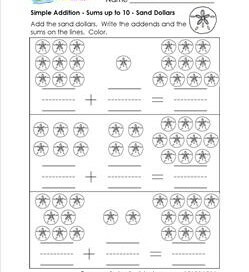 Kids will enjoy adding the sand dollars in this simple addition worksheet. Why are they called dollars when they’re in the shape of coins?